In subjects underwent back surgical treatment the 10% – 40% are identified as having failed back surgery syndrome, implying the suffering of chronic low back pain. Chronic pain influences every aspect of the daily activities since interferes with sleep, employment and social functioning. Further, the patients risk to resort to unmonitored use of drugs, to multiply the search for additional or alternative medical advices, to undergo unnecessary or unnecessarily risky surgical procedures. Despite chronic pain can not always be healed, it can be managed over time. Although a decisive and effective cure has not been identified yet, it was shown that patients who have greater awareness of their pain management skills can improve health, sense of well-being and involvement in daily activities. Unfortunately, no structured healthcare programs aimed at assisting these persons with a patient-centered and holistic perspective (clinical, psychological and physiotherapeutic) have been developed and routinized yet. According to this, the present project is aimed at proposing an innovative patient-centered supporting approach and at demonstrating its positive effects on patients’ quality of life, in order to substantiate its introduction as novel routine healthcare strategy. This approach consists in enrolling the patients in a course-based program which shifts the emphasis from fighting against pain to planning and recovery. Patients suffering from chronic pain due to failed back surgery syndrome will be taken into account and the courses will be conducted by a pool of healthcare professionals experienced in the treatment of chronic pain: pain management clinician, spine surgeon, physiotherapist, psychologist, chemist, occupational therapist. 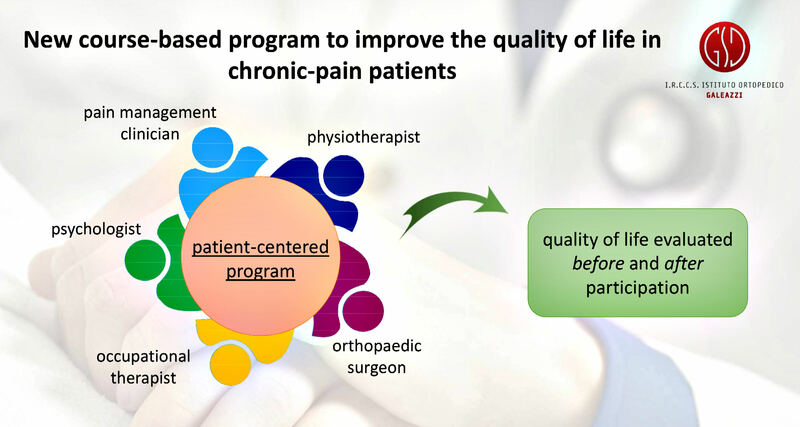 Objective outcomes from self-report surveys, extent of pain area and clinical assessment, obtained before and after the participation in the courses, will be compared in order to verify the efficacy of the program. The project will be conducted at Galeazzi Orthopaedic Institute (Milan, Italy) and accounts two Italian partners: the patients’ association ‘Amici della Fondazione ISAL’ and the citizenship organization ‘Cittadinanzattiva’.